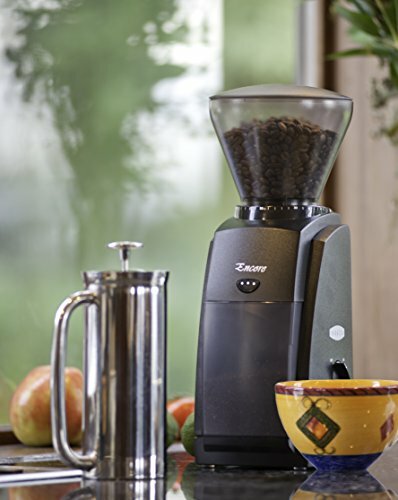 The Encore is Baratza’s entry-level grinder for the home brewer. This is a great grinder that I can confidently recommend for grinding your favorite coffee grounds. It builds upon the features of the previous Maestro Plus model, notably with the second generation ‘GB 2.0’ gearbox, which offers increased durability and reduced noise. There is also the addition of an entirely new burr set, which allows the home brewer to grind fine enough for espresso. What are you waiting to see the ultimate Baratza Encore Review? 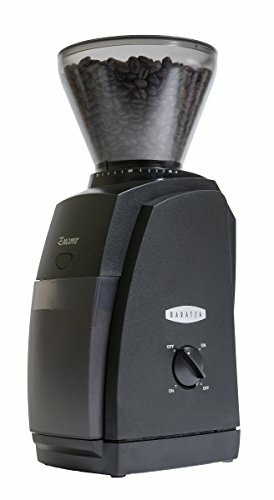 Baratza Griner Alternatives to Consider? The Encore is pitched firmly at home brewers (from novice to the more advanced) who want a grinder that offers versatility, reliability, and simplicity. For the most part, the Encore delivers in all of these areas. From the moment you take it out the box, it’s clear that Baratza has gone to great lengths to keep the design clean, simple and stylish. Even most style-conscious would be proud to have this sitting on their kitchen counter! At 8oz, the hopper is certainly large enough to accommodate most brewers’ everyday needs. The unit also features a weighted base, which feels sturdy and well-made (as you’d expect from Baratza). Other visible features are the basic on-off switch (which boasts a useful clockwise or counterclockwise operation), and the pulse grind button. This offers the coffee drinker the options to grind continuously or intermittently. If you love fresh ground coffee as much as I do (as you should), then pay attention. This just might be the grinder for you! To change the grind size, you simply turn the hopper to the left for a finer grind and right for a coarser grind. It doesn’t get much easier than that! Overall, the Encore has 40 grind settings. For espresso grinding, Baratza recommends setting the grinder anywhere up to 14, but I’d say number 5 works well. Any finer and you risk clogging up your espresso coffee makers. In fact, this highlights just how fine the Encore can grind. At the lowest settings, you get the ultra-fine powdery texture needed to brew Turkish coffee. The fine grind is one of the key reasons to consider this grinder over others. As you might have guessed by now, if you like to experiment with your coffee brewing, the Encore certainly gives you the opportunity to play around. Speed-wise, it takes around 15 seconds to grind enough coffee for a double shot of espresso. While an improvement on the Maestro Plus, the operation is still quite noisy – there are certainly quieter models on the market. For many home brewers, having the ability to grind good espresso will be enough to sell the Encore. But what about those of us attached to our beloved French press and drip methods? Again, Baratza offers up its own suggestions for grind settings for the different brew methods. You’ll want to set it at around 14 for pour-over, in the 18-26 range for drip and up to about 29-40 for French press. If like me, you like your coffee on the strong side, I would definitely dial it down a couple of settings from the recommended, especially for French press – 25 or 26 produces a brew with a real kick! However, you really need to play around until you find the right settings for your particular beans and personal taste – the Encore certainly gives you plenty of scopes to hit your magic grind number, whichever method you favor! The big question is, though: are the grinds consistent? Overall, I’d have to say ‘yes’. Impressive Engine: The Encore benefits from an internal burr calibration system and, not to get too technical, but it also has a reduced burr rotation speed control of 450 RPM. This means, among other things, that you get a smooth bean feed and reduced static, giving you a consistent grind and quantity each time. This is especially important if you dispense directly into the portafilter basket as you can pull a consistent espresso shot every time. Easy Cleanup: Once you’ve finished grinding, cleaning the unit is a breeze. The grounds bin, hopper, and the hopper lid just need rinsing in some hot soapy water. The burrs need cleaning with a brush and from time-to-time with cleaning tablets. While it’s important to clean the burrs periodically to get rid of coffee oils and keep them performing optimally, getting the ring burr back in is quite difficult at first and takes a few goes to get everything back in the right place. When an entry-level home grinder can deliver a grind fine enough to produce consistently top quality espresso, you know you’ve got a decent piece of equipment on your hands. That’s not to say the Encore is perfect – but for the price, you’d better believe there are few superior entry level grinders on the market. I can confidently tell you this is a great grinder, especially for the price. 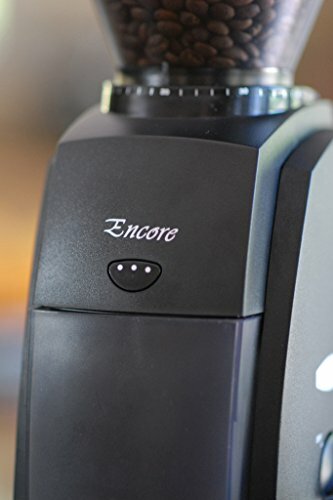 The big selling point of the Encore is the conical burrs that you get in a grinder which costs less than $150. This brings high-quality home grinding within the budget of a lot more coffee lovers. While it can certainly satisfy the experienced home brewer, I’d say this grinder is an especially good option for anyone new to home brewing – or at least, anyone new to making espresso at home, where accuracy and consistency are crucial. With all the equipment available out there to help you make awesome coffee at home, it can be a bit intimidating for newbies. The Baratza Encore Grinder keeps this part of the brewing process simple – once you’ve got to grips with all the grind settings, of course! Of course, not everyone wants that level of simplicity and if the Encore falls short on anything, it’s the lack of advanced features – such as a timer or automatic dosing mechanism – that a more experienced home brewer might want. However, the grinder does allow for user calibration and there are a couple of extra add-ons that you might want to consider. But for the price, overall quality and variety of grind sizes, this really is a contender for anyone serious about taking their home brewing to the next level and getting the most out of their coffee grounds. Easy to Maintain: Maintenance-wise, it’s super easy to clean and take care of. Durable Construction: The durable steel conical burrs grind consistently and feel extremely sturdy. Great for Experimenters: If you are new the world of home brewing and espresso-making, this grinder is a good place to start exploring your brew options without spending a lot of money upfront. Relatively Small Footprint: The Encore is also quite lightweight, has a sleek design, and doesn’t take up too much counter space. 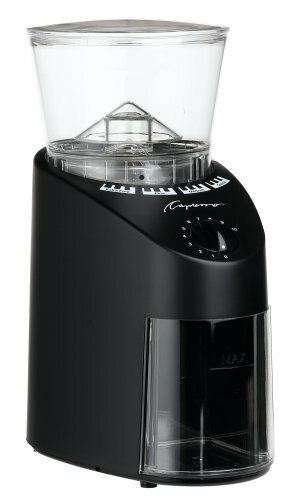 No Auto Dosing/Timer: It might be asking a bit too much, given the price and quality of what’s on offer with the Encore, but if you specifically need features like a timer or automatic dosing then this isn’t the Baratza grinder for you. Needs the Extender for Large Batch Grinder: The 8oz hopper is adequate, but if you plan to grind in large batches you might want to consider the extender. Not the Fastest (or most quiet): It should also be noted that this isn’t the fastest or quietest grinder on the market for grind coffee. Some Complaints of Motor Burnout: External customer reviews have reported various technical issues with individual units, such as motor burn-out after a relatively short period of use. I’ll note that we didn’t personally experience such issues with our unit, but this can happen for high torque appliances from time to time. Looking for something a bit cheaper? The Capresso Infinity (reviewed here) is a good (lower priced) alternative option. It has less “name recognition”, but does a good job for the price point. It also has a variety of grinder settings and does especially well with the coarse grinds, not just the fine grinds. In my in-depth review, I highlight three areas of this grinder that I really love, the timer, the ultra-fine grind setting and the relatively quiet nature of this grinder. While quite settings may not be the big thing you look for in a grinder, it is something I appreciate as I get up earlier than the rest of my house to make the coffee in the morning. That first cup might be ruined if the grinder wakes everyone up – you know what I mean. If you like espresso, you must have an espresso grinder that can give you the best chance at brewing your perfect cup which means, it must produce an ultra-fine grind from coffee grounds and a great flavour. Even if you don’t drink espresso or Turkish coffee on a regular basis, it’s nice to know your smart grinder can perform when needed for guests. Something Specifically for French Press? If French Press is your default, check out these top options. One of the top choices I made in this best of list was the Baratza Encore Conical Burr Grinder, which is a decent choice for all you French Press coffee lovers. In a sentence? If you’re looking for a good quality, entry-level grinder that’s easy to use, easy to maintain and offers grinding options from Turkish coffee through to French press, all for less than $150, you could do a lot worse than invest in the Baratza Encore Grinder. Previous Post: « Review: Is the Keurig Rivo Worth the Price?